Carrots are an excellent source of vitamin A, which is good for vision, and fiber that is good for digestive comfort. 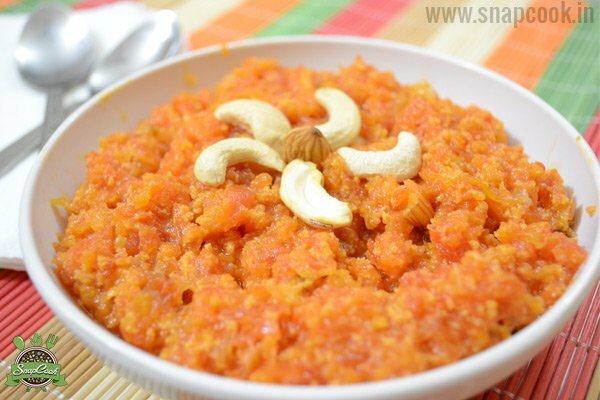 Carrot Halwa is perfect combination of nutrition and taste and it is very light and popular Indian dessert. A divine Indian dessert perfect for a wintery evening. This microwave recipe is easy and quick to make and absolutely no compromise on taste. Now no need to spend too much time slaving on it. My Microwave sets to 900W at P100 (100% power), so the cooking duration may vary with yours. Please use the recipe as a guideline and work out the cooking time as per your MW. In a microwave-safe bowl, heat the ghee at P100 for 45 seconds. Add the grated carrots, stir and mix and microwave it again at P100 for 5-6 minutes. Add milk, sugar and milk powder to it. Stir and microwave it on P100 for 12 minutes. Stir the mixture every 2-3 minutes. Keep eye on it. Add dryfruits in halwa, cover it with lid having some hole (I used the same container that I got with my microwave). Microwave on P60 for another 12 minutes till the carrot is completely cooked and the milk has been absorbed by the carrot. Sprinkle the cardamom powder.Stir lightly and microwave at P100 for 2 minutes, this time without the cling film. Allow to stand for 5 minutes. You can use khoya instead of milk powder. If you want low fat, use skim-milk powder and low fat milk. For diabetic people, use low-fat products, with sugar-free powder. Tastes best with the serving of vanilla ice-cream. Next Next post: How to make your skin Glow?